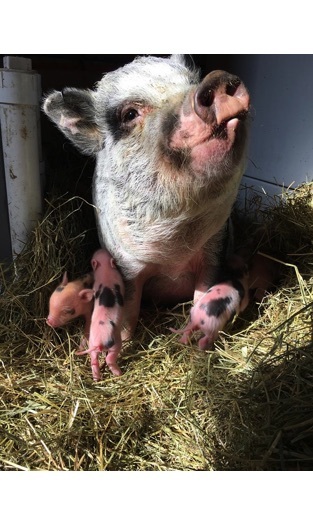 Our mission here at Saddlecroft Farm is to provide a safe, interactive and healthy environment for all of our piglets. We specialize in Mini Pigs and our goal is to provide a healthy, beautiful piglet for others to enjoy as pets. All of our pigs are played with daily, enjoy swimming in the summer and cuddling in the straw during the winter. We are registered with the American Mini Pig Association (AMPA). We encourage everyone to do plenty of research on there own before venturing into pig ownership but our door is always open to enlighten you on the responsibilities involved and the joys that these little pigs can offer. Feel free to contact us with any questions.